Comments on: Rauschenberg, Pelican http://nastynets.com/?p=161 internet surfing club Mon, 30 Jan 2012 07:34:08 +0000 hourly 1 http://wordpress.org/?v=3.2.1 By: tom moody http://nastynets.com/?p=161&cpage=1#comment-47 tom moody Wed, 06 Sep 2006 05:50:07 +0000 http://nastynets.com/surfmachine/?p=161#comment-47 Nice video. I guess we take our high Modernism wherever we can find it. It doesn't look like anyone actually uses that footpath. I'm glad you found a purpose for it. Nice video. I guess we take our high Modernism wherever we can find it. It doesn’t look like anyone actually uses that footpath. I’m glad you found a purpose for it. ]]> By: joel http://nastynets.com/?p=161&cpage=1#comment-46 joel Tue, 05 Sep 2006 06:25:22 +0000 http://nastynets.com/surfmachine/?p=161#comment-46 <embed src="http://www.joelholmberg.com/files/picturemerolling_small2.mov" height=257 width=360 autostart=false loop=true> Its so funny. A couple months ago I made a performance video where I was doing log rolls down Santa Monica Blvd. I was originially interested in how my performance was sort of in a dialouge with the goofy public sculpture on this part of Santa Monica. After looking at these dance images I began to think of the sculptures as theatrical props. Like cheesy versions of high-modern theatrical sets. Its so funny. A couple months ago I made a performance video where I was doing log rolls down Santa Monica Blvd. I was originially interested in how my performance was sort of in a dialouge with the goofy public sculpture on this part of Santa Monica. After looking at these dance images I began to think of the sculptures as theatrical props. Like cheesy versions of high-modern theatrical sets. ]]> By: tom moody http://nastynets.com/?p=161&cpage=1#comment-40 tom moody Fri, 01 Sep 2006 14:07:10 +0000 http://nastynets.com/surfmachine/?p=161#comment-40 Nice. The top ones seem influenced by early "horizontal" Giacometti and that foreground statue in the bottom image is very Tanguy (but also Giacometti-like in its obvious sexuality). The middle one is maybe the most "Noguchi"--those pedestal-like forms could be a collection of individual later pieces of his. Nice. The top ones seem influenced by early “horizontal” Giacometti and that foreground statue in the bottom image is very Tanguy (but also Giacometti-like in its obvious sexuality). The middle one is maybe the most “Noguchi”–those pedestal-like forms could be a collection of individual later pieces of his. 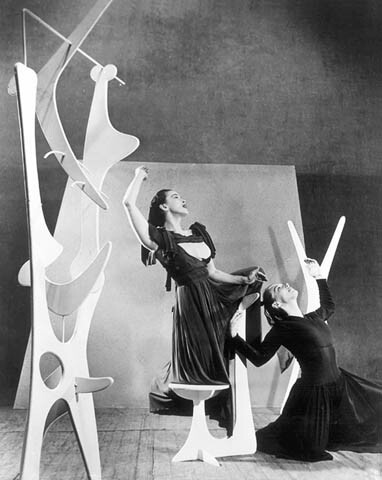 Have you ever seen images of sets that Noguchi made for the Martha Graham company?